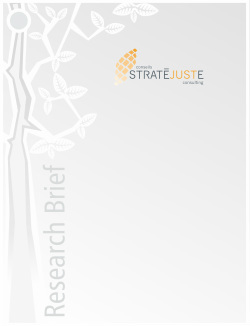 Stratéjuste has developed a series of research briefs. User friendly, policy relevant and available for free download, the research briefs provide concise summaries of some of our recent work. Identifying Useful Approaches to the Governance of Indigenous Data (Nov 2013). Why is a data set created? What stories is it used to tell? What stories should it tell, and why? This brief informs efforts to improve the governance of data concerning indigenous people, especially data that is shared with, or collected by, other governments. Government and Governance: A Guide for the Perplexed (Jan 2016). The terms "government" and "governance" are often confused. This research brief provides a broad-strokes overview of the two terms, then considers how they apply within the Canadian state. The brief seeks to promote understanding between government and non-government actors who work together in collaborative relationships. Selected articles, op-eds, volumes and appearances of interest appear below. Jodi Bruhn, "Do Tripartite Approaches to Reform of Services for First Nations Make a Difference?" Aboriginal Policy Studies 7(1), April 2018. Chris Robertson and Jodi Bruhn, "The Inherent Right to Self-Government Timeline." Transitional Governance Project. Carleton U, Oct 3-5, 2017. Jodi Bruhn, "How spring break could promote indigenous reconciliation," Ottawa Citizen, March 9, 2017. Jodi Bruhn, "Munich, 1933: The Good Bureaucrat, Josef Hartinger," book review in Law and Liberty, June 29, 2015. Jodi Bruhn, "The words that were weapons," Ottawa Citizen, December 8, 2014. Jodi Bruhn, "Identifying Useful Approaches to the Governance of Indigenous Data," International Indigenous Policy Journal, 5(2), April 2014. Jodi Bruhn, "Toast to those who showed courage in public life," Ottawa Citizen, December 29, 2013. Jerry White and Jodi Bruhn, eds., Exploring the Urban Landscape: Aboriginal Policy Research, Vol. 8 (Toronto: Thompson Educational Press, 2010). John Graham and Jodi Bruhn, "In Praise of Taxes: the Link between Taxation and Governance in a First Nations Context," in Jerry White et. al., eds., Voting, Governance and Research Methodology: Aboriginal Policy Research, Vol. 10 (Toronto: Thompson Educational Press, 2010). Jodi Bruhn, "In Search of Common Ground: Reconciling Western-Based Governance Principles with First Nation Traditions," Institute on Governance (May 2009). Also available as 6-page policy brief. Laura Mitchell and Jodi Bruhn, "Best Practices in the Governance of Aboriginal Service Delivery Organizations," Institute on Governance (March 2009). The partners at Stratéjuste are committed to contributing to a constructive dialogue on pressing policy, governance and public ethics issues that matter to us, to our clients, and to all Canadians. What policies, practices and institutions need to change? How to change them? The series So What's the Strategy? digs beneath the rhetoric on issues of long-standing importance to discern their underlying challenges and possibilities. All articles address our core knowledge areas. Editorial in nature, the articles represent the views of their individual authors and not necessarily those of Stratéjuste, its partners or associates.